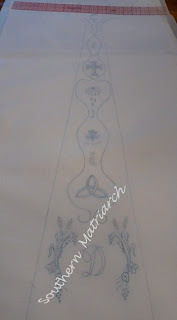 Southern Matriarch: Let the embroidery begin! and 100 posts! Think this baby is Irish? 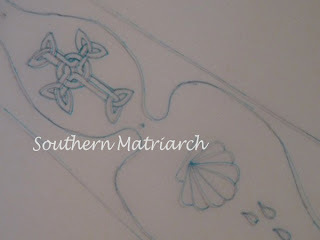 I also traced a few non obnoxious shamrocks on the yoke and some will go around the hem if time permits. I plan to use padded satin stitch, trailing, seed stitch, stem stitch, shadow work, lazy daisies, granitos and applique cord in this design. Yes I do trace my embroidery with a blue wash out marker. NO I don't use pencil. For me pencil is evil. Yes I starched my fabric before tracing (about 6-8 layers), yes I used a #2 pencil, yes I have tried an Ultimate Marking pencil (Ultimate evil as far as I am concerned), yes I have used a #3 pencil. You want to know when and if you will want to commit hari kari? Spend 100+ hours on an embroidered panel and not have the *&#! pencil come out. No matter how long you soaked it or what you soaked it in. So no, I don't trace with pencil. I use the blue marker by Clover. They have a fine point and a wide point point marker. The fine point is not a felt tip, it is something hard. So it makes a fine line and doesn't dry out as quickly as some others. I buy them by the 3's. If I keep the pen moving as I trace it doesn't bleed out into a fuzzy line either. Of course if I left it in one place I would have bleed lines. Now there is one drawback to tracing in blue wash out marker. Watch your water glass! Don't ask how I know. And HAPPY ONE HUNDRETH POST! How fitting that the first post introducing myself to blog land was about christening gowns as well? I am off now to gather threads and hoop the part(s) that need to be shadow worked first. Thanks for your insight on the blue marker...I have always been leery of using a marker...worried about bleeding or it not coming out. I'll give it a second thought, thanks to you! 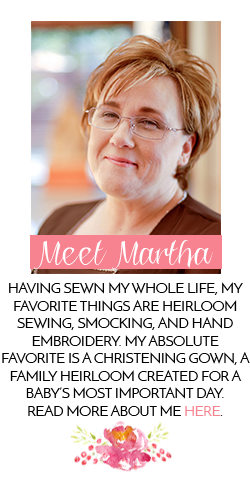 Oh, Martha. I know. I have had issues with pencil as well. I have better luck using blue lead, but still, unless it is covered it doesn't come out. The only reason that I don't like the wash away marker is that I can't see my work as clearly. But that is a small price to pay, right? Your design is lovely, and I can't wait to see it worked up! 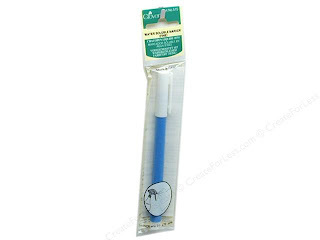 I use the blue marker when I need a line drawn. Steam irons make the line disappear like the glass of water. I am very anxious to see this Christening gown. I'm a pencil girl who feels like she is in the confessional here. (red face)I just have had ghosting issues with all those markers. Could be user error, though. I soak in Biz and use a toothbrush if necessary. So far no problems. Of course I mark extremely lightly. Happy 100 posts! I can't wait to see the new christening gown! Thank you for the blue marker info. I have a purple one and a white one, which I am in love with. I was thinking of getting a blue one so I do appreciate the info. Thanks and congrats on post 100!